In 1972 Donald Stewart, founder of the Maryland Naval Militia learned that Torsk might be available and petitioned the Navy to transfer her as a museum vessel to the Maryland Naval Militia. On September 26, 1972 Torsk was transferred to the State of Maryland, and towed up the Chesapeake Bay from Norfolk to Baltimore by US Army Tug LT1971. 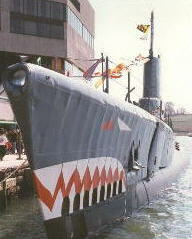 On May 1, 1973 Torsk was established as the Maryland Submarine Memorial, and berthed in Baltimore. Today she is part of Historic Ships in Baltimore, along with USS Constellation, USCGC Taney and USLS Chesapeake. Torsk is one of two surviving Tench class Fleet Submarines in the United States. The other is USS Requin (SS-481) in Pittsburgh, PA. Several other submarines of the class were sold to foreign countries. One of those boats, USS Tusk SS-426 was sold to the Taiwanese Navy in 1972. She became the Hai Shih 791, and as of 2015 she is still on active (although limited) duty. At 71 years old she is a testimony to the quality of construction that went into the Tench class as well as the other classes of submarine built during WWII!